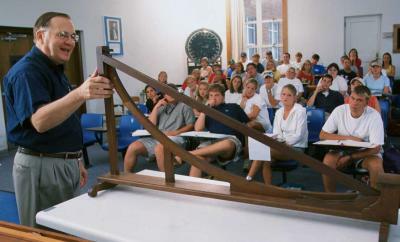 Professor Emeritus Bolen demonstrating the Brachistochrone. The Department of Physics and Astronomy offers a large catalog of courses at the undergraduate and graduate level. To see which are available in any given semester, please check the current course list or query the University Course Schedule. Lab Physicist’s Website (Thomas Jamerson) — Information for students in introductory physics labs (PHYS 107/108, 215, and 221/222); also provides links to the tutoring schedule and lab calendar. Lab Physicist’s Website (Luca Bombelli)— Information for students in introductory physics labs (PHYS 223/224); also provides links to online lab images. Kennon Observatory Director’s Website — Information for students in introductory Astronomy labs (Astro 103/104).